So, who here remembers Pogs? I'm sure a lot of you do. I do, though I never owned any. It never got as big in my school as it was all over the rest of the world. Well, they're back, of sorts. Battle Pogs doesn't have you flipping stacks of cardboard pieces. Instead, you're looking to get a high score by spinning your coin and seeing what numbers and mathematical operations show up. 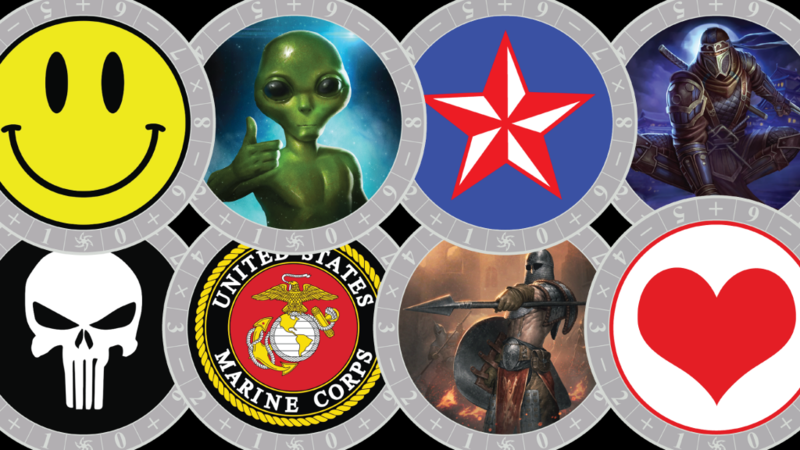 Battle Pogs is great for improving math & memory skills. Players battle each other by spinning brass coins that are used to add, subtract, or multiply their current points. You only need ONE coin to play. You place the common side of the coin facing the playing surface and spin it like a top. Stop the coin by placing your finger at the bottom of the coin. The result is the first visible symbol or number to the left of your finger. On the first spin of your turn, use the symbol (plus, minus, or multiply sign) to the left of your finger, to modify your current points with the result of your second spin. On your second spin, use the number to the left of your finger. For example, if you have 10 points to start your turn and your first spin is an X (multiplication sign) and your second spin is a 3, the result is 30 points (10 x 3 = 30). Multiplication signs are usually good unless followed by a 0. If that happens, it takes you back to 0 and you must build your points again. During a game, your points change since you are constantly adding, subtracting, and multiplying. Every turn there is a chance of "busting." However, you can stop spinning before any turn and keep your points. You need to know when to quit spinning and hope your opponent does not beat your score. The Kickstarter campaign is up and running now. It's about halfway to its goal with 29 days left to go.